Welcome to the Crazy Crafters Blog Hop for November. This month we are excited to show off our "Most used stamp set". We hope you find great inspiration from the projects. You may just be starting the blog hop here at my blog - Kylie Bertucci or may have come from the person previous to me in the list. If you get off track at any time, the full lineup below will help you move along from blog to blog so you see all the projects. At the moment you are visiting Kylie Bertucci. I had a few choices of what stamp set I could choose for this theme - but I decided to go with the Lighthearted leaves stamps set. I LOVE that set and it won't be around for much longer, unless... hopefully it appears in the next catalogue but that will be six months away! Boo hoo. 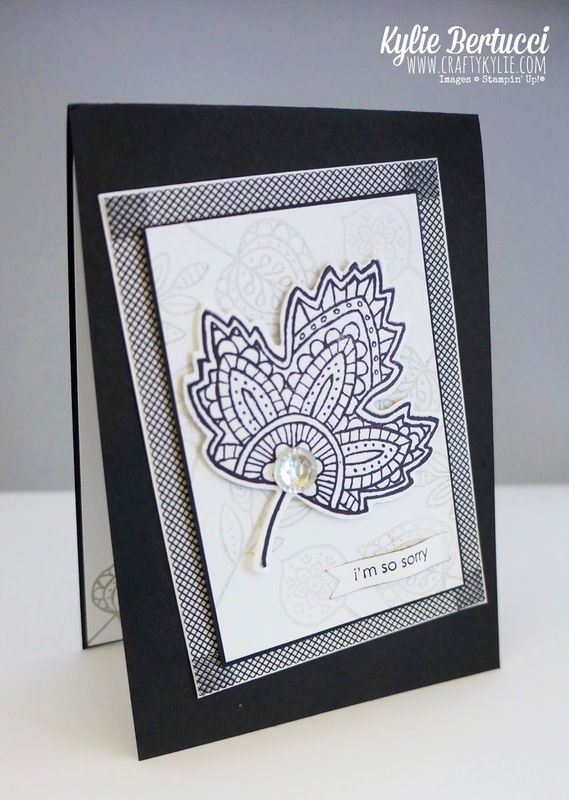 The Lighthearted leaves in monochrome really adds that elegant and classic look that could be appropriate for a wedding card, anniversary or even a sympathy card. I love the look of the lighthearted leaves softly stamped in the background. I did this in Smoky Slate and stamped off so that it wouldn't distract from the main feature. That gorgeous Leaf with the Iced Rhinestone. Are you wondering what that border is? Its washi tape. Doesn't it look fantastic? 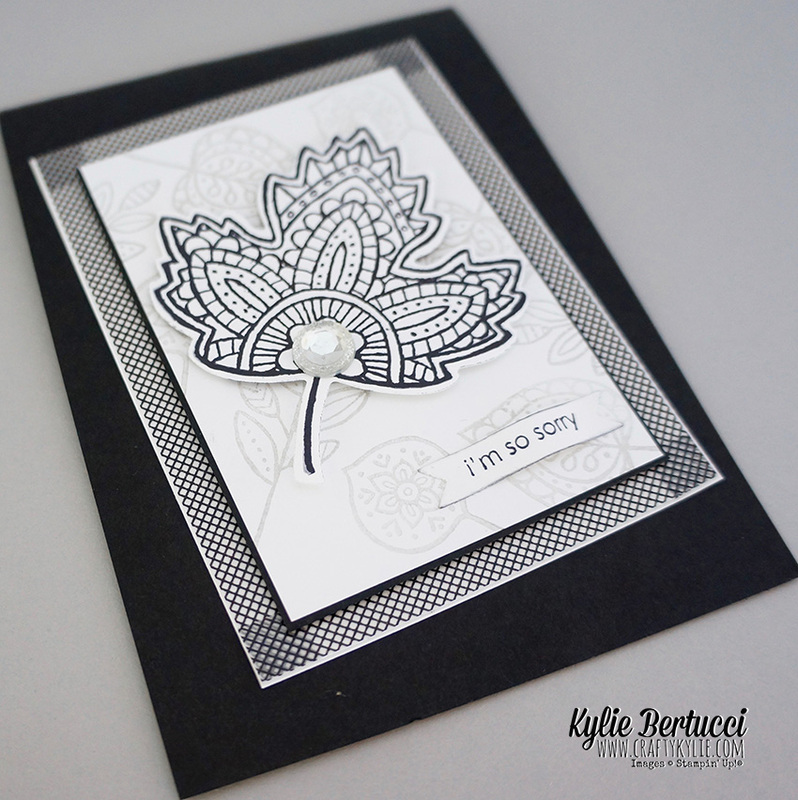 Such a great way to add texture and a pattern without even using Designer Series paper. I will be using this idea much more often. Sadly my card is for a sympathy card - the sentiment I felt disappeared into the background so I sponged it in basic black and then played with the cut out so that it curved a bit, just to add a bit of texture without using dimensionals. I hope that you enjoyed coming to my blog and seeing my card using my "Most Used Stamp set". Make sure that you keep hoping by clicking on the person after me in the line up below. Remember you are currently visiting Kylie Bertucci. So you know who to hop to next. If you like what you are seeing here on my blog you can subscribe to get my post updates here. Colour choice makes this absolutely stunning Kylie! Lovely card Kylie. I am so glad you inspired me to buy it. Very elegant - great card! Love this set-you've shown us some great ways to use it and this card is no exception. On my shopping list! This reminds me of what Shelli Gardener said to you when you were sick with Altitude Sickness on the Grand Vacation. hahaha!!!!! Just gorgeous, Kylie! I love the bold, graphic look of your cards - this one is no exception. Just beautiful! Oh! and thanks for letting me hop along with your group. What a great group of talented stampers!